It is that time of year. The time of year where every gardener has to dig deep and get creative or else let bushels of squash go to waste. The kids are wise to my squash-hiding tricks, so I had to pull out my secret weapon: Pizza! 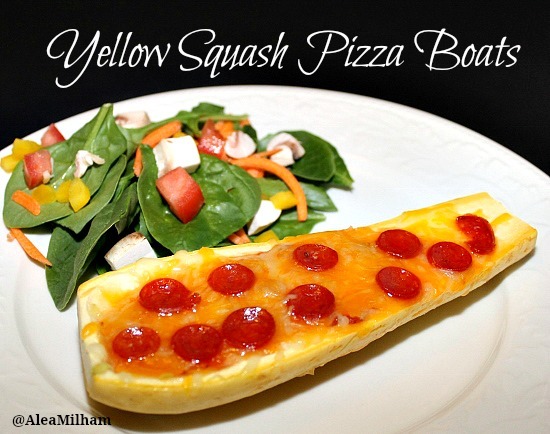 It may seem a little underhanded, but kids have a hard time resisting pizza and I used that to my advantage when I created these yellow squash pizza boats. 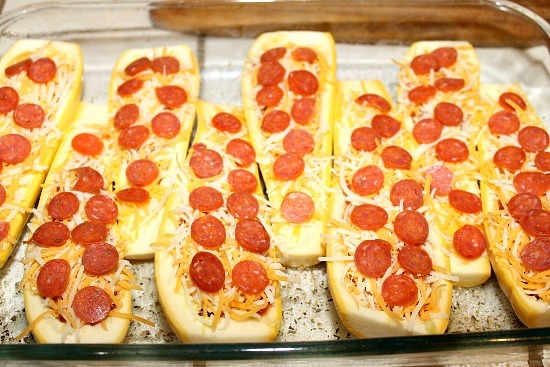 You don’t have to put all of the pizza toppings on top; place some of the toppings inside the squash boats. Then add the pizza sauce, top with cheese and more of your favorite pizza toppings. 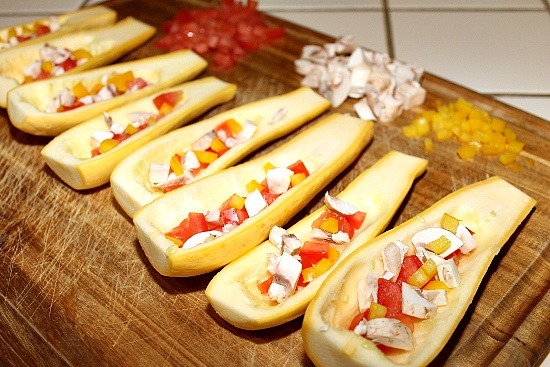 I chopped up some vegetables to place in the boats and then used the leftover chopped veggies in our dinner salad. You can make extra and use them for an easy lunch the next day. You can reheat them in 1 – 1 1/2 minutes in the microwave. Preheat the oven to 350 degrees. Brush a casserole dish with olive oil. Sprinkle the dish with garlic powder, onion powder, oregano, basil, and thyme. Cut the squash in half length-wise and scoop out the seeds. Place some of the pizza toppings inside the boat. Spoon pizza sauce over the toppings. Place a couple of tablespoons of cheese on top of the pizza sauce. Add more of your favorite toppings.